Venice (and Cinema) will be the theme of the Pre-inauguration (August 30), to be held in Campo San Polo, of the 68th Venice International Film Festival (31 August-10 September), directed by Marco Mueller and organized by la Biennale di Venezia chaired by Paolo Baratta. The preview Italian screening of Impardonnables (2011, 111 mins), written and directed by the French film maestro – and a member of the Jury for the Venezia 68 Competition – André Téchiné, who chose Venice as a suggestive location for his new film with André Dussollier in the role of Francis, a writer who comes to the island of Sant’Erasmo to work in peace on his new novel. Impardonnables, from the novel by Philippe Djian, also stars Carole Bouquet, Mélanie Thierry, Adriana Asti, and Mauro Conte. It is produced by SBS Films, C.R.G. International and TF1, and was presented at Cannes in the section Quinzaine des Réalisateurs. 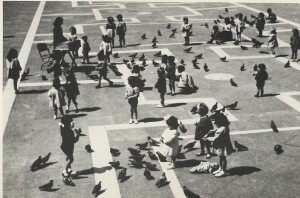 “The documentary focuses on the pigeons in Piazza San Marco, in Venice. It would be impossible to conceive the city of the Doges without these cordial and trusting little animals that every tourist wants to take his picture with, that eat the corn out of anyone’s hands and fly quickly up to the wonderful Basilica they have chosen as their home. But Pasinetti, as he follows his pigeons, actually focuses his camera on the less familiar and even secret (to non-Venetians) corners of the city, showing fragments of “minor” city life filmed with live recorded sound. With unusual light-heartedness he even appears in an ironic cameo (like Hitchcock) with his back turned as he frames and photographs the island of the Giudecca”. I piccioni di Venezia (1942, 12 mins) was written and directed by Francesco Pasinetti, with photography by Antonio Schiavinotto, and music by Antonio Vivaldi. It was produced by the Istituto Luce. In Impardonnables Francis (André Dussolier) comes to Venice to write his next novel. He wants to rent a place to work. He meets Judith (Carole Bouquet), a real estate agent. She insists that he visit an isolated house on the island of Sant’Erasmo. Francis suggests that they ‘make the plunge’: “What if we lived here together? Shall I sign right away?” And so they begin life as a couple. But Francis falls in love, and is no longer capable of writing. The following summer his daughter Alice (Mélanie Thierry) arrives to spend her vacation with him. But the girl suddenly disappears. From that moment onwards, is Francis in danger? “The power of this city is like a drug,” said André Téchiné about Impardonnables. “ I had already made several attempts at writing a screenplay set in Venice, but none of them worked. Venice has been used as a decoration too often, a decoration loaded with an all-too-familiar mythology. This time, when I read the novel, it was very simple: because Judith was a real-estate agent and Francis a writer, she would have had her agency in Venice (I know there are lots of them here) and he would be moving there to write. The city thus belongs to the characters. It is linked to their work. It would become a framework for their life and no longer the picture frame based on which I had tried to build a story before”. “Venice is in fact viewed as a city-refuge,” observed Téchiné. “A refuge from all the evil in the world and, as Alice, Francis’ daughter (Mélanie Thierry) says: ‘It has jobs!’. But we will see that even this apparently safe and peaceful place cannot escape from the violence in the world”. “At the heart of the film are the ages of life. And in Venice time is infinitely more materialized than anywhere else. It strikes you from the façades of the houses where it can be felt with such force when the bells ring or the seagull squawk. And when you leave this city of stone and water and head out to the islands, the seasons become surprising and materially visible. The relationship between nature (the lagoon) and culture (Venice) produces a particularly intense, almost electric shock. The characters walk and navigate. And I use these motorboats, which are so popular in Venice, comically at the beginning, then lyrically, and finally, in an action scene” (André Téchiné). Grandson of Guglielmo Ciardi, one of the great painters in nineteenth-century Venice, Francesco Pasinetti dedicated his brief but intense life to the “new” images of the twentieth century: photography and film. He graduated in Italy (in 1933) with a thesis in which the Tenth Muse was raised to the ranks of the arts, he later expanded and corrected the text (1939) which then became the “Storia del cinema dalle origini a oggi”, the first organic history of film to appear in Italy. At the same he began to collaborate as a critic and editorialist in newspapers and magazines, and to make largely experimental works with the Cineclub first and the Cineguf later, until he founded his own production company in 1934 to film Il canale degli angeli, his only feature-length film. Because later, try as he might, he was unable to film anything but his extraordinary short films. These were in part dedicated to his city, Venice (including, in 1942, Venezia minore, La Gondola, I piccioni di Venezia, and in 1947, Piazza San Marco and Il Palazzo dei Dogi), but also sensitive to social values (Nasce una famiglia, 1943), to the world of art (I pittori impressionisti and Arte Contemporanea, shown at the Biennale in 1948), and industry (Lumiei and Piave Boite Vajont, 1947). He worked in theatre and opera (with Gian Francesco Malipiero). But above all, having founded the magazine “Il Ventuno” with his brother Pier Maria, he became a talent scout for young people in the most diverse fields: Glauco Pellegrini and Michelangelo Antonioni, Pietro Ingrao and Renato Guttuso, Alida Valli and Carla del Poggio… He was an acclaimed maestro when, having moved to Rome as the Director of the Centro Sperimentale di Cinematografia, he died of an aneurism in 1949: he was not yet 38 years old. On June 1st of this year, he would have been one hundred. With the pre-inauguration of the Venice Film Festival, a regional committee launches a program of events to celebrate the centennial of his birth.